Second story double-hung windows do more than let the breezes flow through the upstairs of this home. Visually the small, second-story double-hung windows do more than let the breezes flow through the upstairs of this home. The rectangular muntinned window panes anchor the randomness of the beautiful field stone facing. Functionally they control ventilation, can be cleaned without using a ladder, and architecturally enhance the country feeling created by the multi-colored stones. 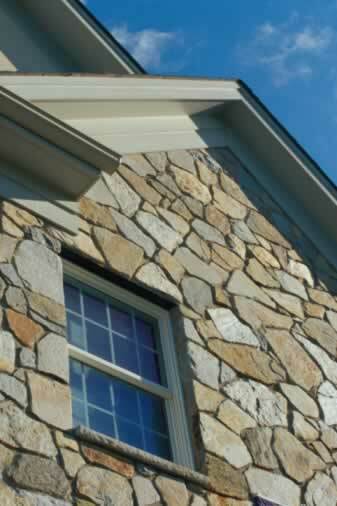 The trim and window frame are painted a soft natural color that blends with the stone. The double-hung windows are also one of the safest choices possible in a multi-storied house, as once the lower half is raised, nothing obstructs exiting the window in case of a fire, and externally nothing protrudes to hamper fire fighters. These windows create a winning combination of beauty, function, and safety, while framing the stars at night and a view of what's happening in the yard by day.